Full long wig with cat style ears styled into the wig. The wig features an elastic band for a comfortable and secure fit to almost any head size and is available in a wide range of colors. 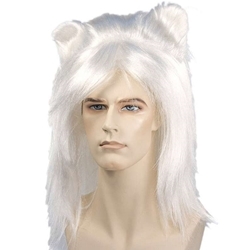 The Anime Japanese Beast Cats Style Wig can be used for a number of different characters from Animes and Japanese culture. It can also be used the Beast in Beauty and the Beast or for the cast of the show Cats.